New Antarctic rift data has implications for volcanic evolution — Ben-Gurion U. NEW YORK…August 21, 2018 – New data revealing two tectonic plates fused to form a single Antarctic Plate 15 million years later than originally predicted and this extra motion has major implications for understanding of the tectono-volcanic activity surrounding the Pacific Ocean, from the Alpine mountains in New Zealand to the California geological setting, according to research from Ben-Gurion University of the Negev (BGU). 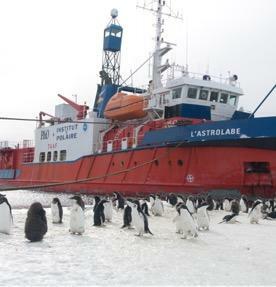 In a study published in Nature Communications, Dr. Roi Granot of BGU's Department of Geological and Environmental Sciences, and Dr. Jérôme Dyment from the Institut de Physique du Globe de Paris, France, present marine magnetic data collected near the northern edge of the West Antarctic rift system that shows motion between East and West Antarctica, which was assumed to have ended abruptly 26 million years ago, actually continued for another 15 million years. "Since Antarctica tectonically connects the Pacific Plate to the rest of the world, these results have important ramifications for understanding the tectonic evolution around the Pacific Ocean – the rise of New Zealand's Alpine Mountains, motions along the San Andreas Fault in California, and more," says Dr. Granot. Over 200 million years ago, a rift bisected Antarctica. The motion between East Antarctic and West Antarctic Plates accommodated along the length of this rift created one of the longest mountain ranges in the world (the Transantarctic Mountains). It also caused the eruption of hundreds of volcanoes, mostly under the ice sheets, and shaped the sub-ice topography. These motions dictated, and still dictate, the heat flow rate that the crust releases under the ice and is one of the factors controlling the rate by which the glaciers are advancing toward the surrounding southern ocean. GPS data and a lack of seismic activity suggest that the rift in Antarctica is no longer tectonically active. According to the researchers, one of the key unanswered question was: How did the plates drift relative to each other over the last 26 million years and when did the rift stop being active? New marine geophysical data recorded during two excursions on a French icebreaker enabled Drs. Roi Granot and Jérôme Dyment to date the ocean floor and calculate the relative motion between the Antarctic Plates and the Australian Plate. "Antarctica forms an important link in the global plate tectonic circuits which enable to calculate the motion along different plate boundaries. Understanding past plate motions between East and West Antarctica therefore affects our ability to accurately predict the kinematic evolutions of other plate boundaries," says Dr. Granot.